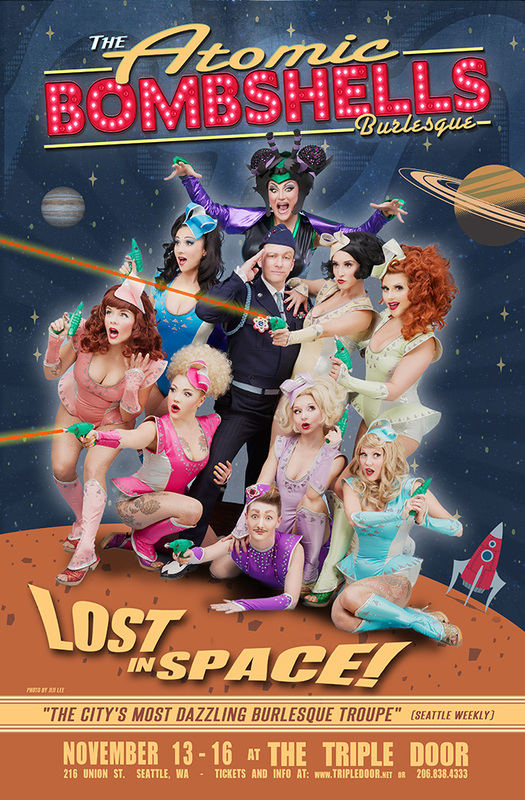 The Atomic Bombshells in “Lost in Space” at The Triple Door. At the time, did you expect that the troupe would still be around ten years later? No doubt that two month experience bonded the newly formed troupe together and helped to prepare them for the next ten years. Not everyone who is part of the troupe today was there ten years. How has the group changed? Folks love to learn little facts about the performers they admire. At the risk of getting you in trouble with group, can you give us a little insight into the group? For example, which of the bombshells is the biggest practical joker? Who is the most fun performer to work with? Who is the most serious member of the troupe? Which of the group is the most positive and upbeat? From just fifteen minutes of watching your rehearsal earlier, I can tell that your upcoming show is going to extremely entertaining. What can you tell me about “Lost in Space” opening at the Triple Door this week. What can the audience expect to see? How do you take the concept, the music and transform it into a show? Then the magic happens. I have never seen “Lost in Space” before, but from all that I have heard, the still shots which I have seen and the fifteen minutes of rehearsal which I got to sit in on, leads me to believe it is going to be an incredible fun evening for the audience. The fact that Kitten calls it her favorite show to perform is just icing on the cake. When you consider all the work that goes into creating an over-the-top show as this, it seems criminal that audiences will only have a couple of days to enjoy it. If you have not secured your tickets for the show, head on over to the The Triple Door. I highly encourage you to do so. By now, our once hot green tea had long since turned to ice tea and I could tell that Kitten La Rue was anxious to get back to rehearsals. I thanked her again for graciously indulging me with my questions and making time for me in her busy schedule. One last question. She smiled. Clearly you are keeping yourself incredibly busy with your troupe, as well as with your Kitten N’ Lou shows, but what about you? What is the next mountain for Kitten La Rue to conquer? She looked thoughtful for a moment, considering what she could divulge to me. She shook my hand firmly with a wink and proceeded to head back to the dance studio, where Lily and the rest were anxiously tapping their feet wondering what had become of their Kitten La Rue. No doubt they would playfully give her grief for messing around while they were rehearsing. That is what a family does. Kitten had said that The Atomic Bombshells were more than just a burlesque troupe. Most of the troupe has been rehearsing and performing together for a decade. Kitten La Rue describes them as a real family. I like that. It is the way it should be. Kitten La Rue – trail blazer, risk taker and crafter of fantasy worlds to inspire us to dream again. As I put on my coat and headed out into the chilly dark streets of Seattle, I found myself reflecting upon my interview. I was struck by what an amazing human being I just spoke with. She was personable and outgoing. Confident, sharp and a critical thinker. Passionate about her life and her work; cogent and well-spoken. She had it together and seemed enviably at peace with who she was and what she does. I was impressed with her drive and determination, although she has achieved so much she does not appear to be resting on her laurels. She still excitedly embraces each new challenge that comes her way. A case in point is her guest performance off Broadway in the musical in New York, which received rave reviews from the New York press. Kitten La Rue has defied convention and beat the odds, not only in reaching for her dreams, but in achieving them and finding her niche in life. In talking with her, it is readily apparent that she truly loves and is energized by what she does for a living. That alone should make 90% of the country green with envy, as it seems so few of us can say the same. Kitten rejected the mundane existence which most of us toil under, embraced the exotic ‘bigger than life’ fantasy and has succeeded. 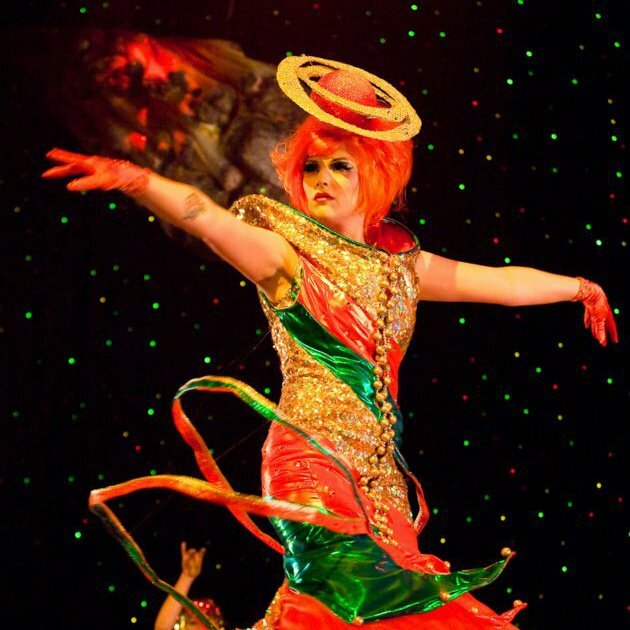 There is hope for each of us to catch on, as it is Kitten La Rue’s desire to bring that fantastical world to life for the audience at each and every one of her performances. Perhaps her passion will rub off on the rest of us. Kitten, continue to lead the way and perhaps in doing so, others might find the courage to tackle life with the zest and passion which you have. We can only hope.